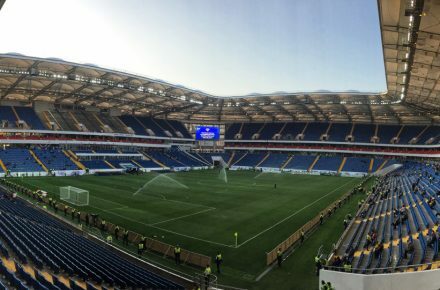 The Rostov Arena is a recently opened new stadium in the city of Rostov-on-Don that was built for the 2018 World Cup and will become the new home of FC Rostov. Plans for the new stadium became concrete when Russia got awarded the 2018 World Cup and Rostov-on-Don selected as a host city. The final design was chosen in December 2012 when Populous got selected as the architect. First ground preparation works started in 2013, but it took until early 2015 for actual foundation works to start. The stadium was expected to be completed in 2017, but the opening got delayed to 2018. 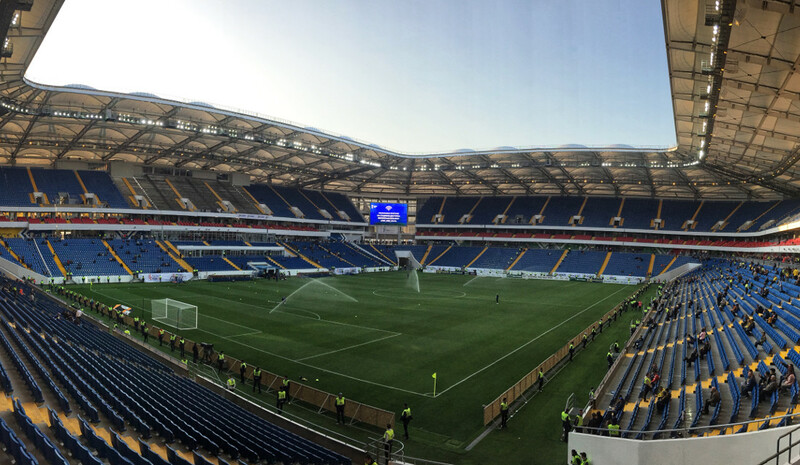 It officially opened on 15 April 2018 with a league match between Rostov and Khabarovsk. After the World Cup, the stadium will be scaled down to a capacity of 25,000. The design of the stadium is inspired by the ancient mounts of earth, Kurgans, that can be found in the region. The Rostov Arena is located on the south bank of the river Don not far from the centre of Rostov-on-Don. It’s an approximate 15-minute walk to the stadium from the foot of the bridge over the river Don near Rostov’s centre. Rostov’s main railway station is located on the western edge of the city centre at roughly 4 kilometres from the stadium. Tram 1 and 4 run right through Rostov’s city centre from the railway station. Get off at stop Voroshilovskiy Prospekt and walk across the bridge to the stadium. Bus 39 is a direct connection from the station to the stadium, but doesn’t run through the centre. The Rostov Arena is located on the south bank of the river Don. It is not the most appealing area, rather barren with some industry around enclosed by wide roads, though the stretch around the river bank is pleasant and boasts a few restaurants. The large Megamag shopping centre isn’t too far away either, a 10-minute walk from the stadium away from the centre, and has plenty of food outlets. Still, eating and drinking is much better done in Rostov’s city centre on the north bank. There are a few hotels on the river bank near the Rostov Arena, though with the disadvantage that you’re rather far out of the centre. These hotels include Golubaya Volna, Vysokii Bereg Park Hotel, and the luxurious Hotel Petrovsky. Otherwise, a hotel across the bridge in the city centre would make an obvious pick: Hermitage Hotel, Mercure Rostov-on-Don, Europe Hotel, and Boutique Hotel Promenad all get good reviews. Click here for an overview of hotels near the Rostov Arena and here for other options in Rostov-on-Don. Fc-rostov.ru – Official website of FC Rostov.